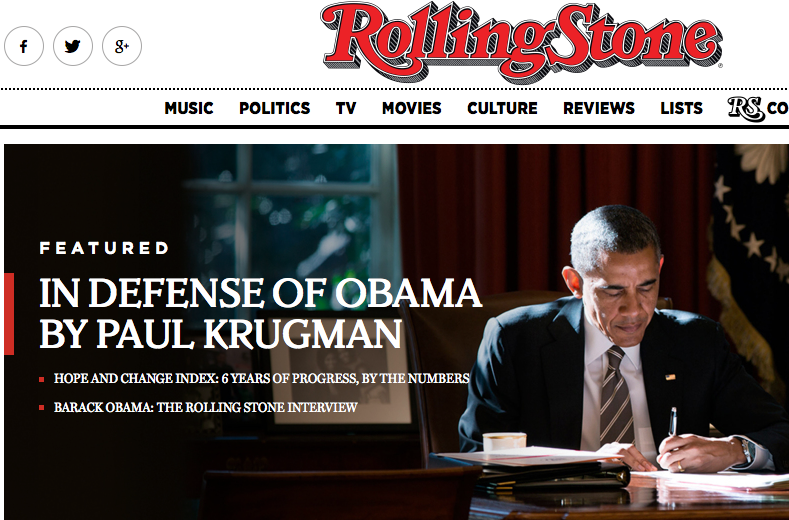 Paul Krugman, Obama: Presidency historically successful, says liberal columnist. Krugman’s case in a nutshell: Though Obama’s hasn’t been able to elevate the national discourse through empathy and understanding, and his surveillance-state policies are troubling, he’s done an excellent job domestically digging out from the situation he inherited and pointing the country in the right direction for the future. His health reform is imperfect but still a huge step forward – and it’s working better than anyone expected. Financial reform fell far short of what should have happened, but it’s much more effective than you’d think. Economic management has been half-crippled by Republican obstruction, but has nonetheless been much better than in other advanced countries. And environmental policy is starting to look like it could be a major legacy. To be frank, Krugman’s piece feels a little perfunctory, and it’s light on details; none of it will surprise you if you follow writers like Jonathan Chait and Michael Grunwald who have been making the case for years that Obama has been an effective president, policy-wise, given the constraints of our political system and electorate. Krugman also, somewhat surprisingly given the source, doesn’t mention President Obama’s lack of interest in the lobbying/corporate-money-in-politics issues that Candidate Obama talked about often. And then there is the not super-great state of American race relations. Of course, you could file both lobbying and race under “things Obama couldn’t have done anything about even if he’d tried,” and in any case, Krugman’s overall project of taking a moment to look at the long view isn’t the worst idea at a time when the day-to-day view is so depressing. Read the whole piece here.